What Are the Best Puppy Collars and Dog Training Collars? There are many tools you can use to train your German Shepherd. Each of them has pros and cons. If you are trying to figure out which collar to use, this may help you decide. Instead of bringing the collar to your dog, let or invite your dog to come to it. Make it a positive experience so your dog will be neither fearful, or think that you are playing a game with her. Some of these may not be suitable as puppy collars. It is best to check with a dog training professional to help you decide among the best puppy collars. When choosing puppy collars or dog training collars, please remember that dogs are bred with a natural instinct to push against pressure. 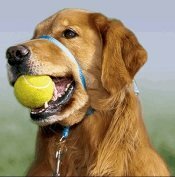 Ever notice that your dog will continue to pull even while choking? This "opposition reflex" can make some collars dangerousif not used under the proper supervision. Choke collars are meant to provide a temporary correction. Tightening the chain around the neck gets your dog's attention. Releasing it implies that your dog is doing what you intended. When used correctly, it is not supposed to cut off her breath. 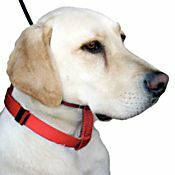 The choke collar fits around the strongest part of your dog's neck. This in an of itself can present an issue. The problem with a choke collar is that your dog can literally choke herself to death. Never leave a choke collar on your dog while unattended. This works similar to the electronic collar. Instead of a shock, an unpleasant spray of citronella is emitted. This is typically used to deter barking. A microphone in the collar triggers the substance. This is unpleasant for the dog as it irritates her sensitive nose. Be aware that this collar can be activated by the barking of other dogs. Many dogs will bark out of boredom. If your German Shepherd has uncontrolled barking issues, the best advice is to make sure she has an outlet for her seemingly endless energy. Also known as the shock collar, an e-collar needs to be used correctly, or it can cause more harm than good. An electronic collar, when handled properly, provides an immediate correction. Since dogs live in the moment, it is imperative that the shock is administered directly - in the split second - the time the undesired behavior occurs. The duration of the pulse should only be one-fortieth of a second and will feel like a mild electric shock. This is similar to the sensation felt when you scuff your feet on carpet and touch another person. Consult with a professional before attempting to use this collar. By working with an experienced e-collar trainer that knows how to minimize the punishment, your dog will immediately associate the behavior at hand with an undesired action. Otherwise, your dog may not understand why she is being shocked. And it may damage the trust between you and your dog. Also called the halti, or head collar, a halter is designed to lead an animal by its head. This is the same way humans have managed larger animals much stronger than us, such as horses. A halter is also called a Gentle Leader collar. The halter works best on long-nosed dogs, such as German Shepherds. But, without proper use and fitting, it can be ineffective and uncomfortable. The downside to a halter is that your dog may not like the unusual sensation of a loop around her mouth. It is extremely important to have a halter properly fit so that it does not chafe your dog's nose. With proper fit and effective use, it can become a great training tool. Even if you're on crutches, you will have no problem walking your dog with this puppy training tool. A properly fitted Gentle Leader Collar , used correctly, will keep your dog from pulling. Harnesses were designed for pulling. Or tracking. Not for controlling. Huskies were harnessed to pull sleds over the snow. German Shepherds sported a harness to carry loads. And Saint Bernards wore harnesses to rescue people lost in the snow. A harness allows your dog to leverage its entire weight to perform a task. Remember this the next time your dog pulls you down the street while wearing a harness. While tracking, the harness allows your dog to have full contact with the ground, unlike a traditional dog training collar. Dogs that do not pull may be fine with a harness, but it may trigger a pulling reflex in other dogs. There are harnesses that are designed to be no-pull or anti-pull. These harnesses place a gentle pressure on your dog's chest when she pulls. The sensation is designed to be uncomfortable to discourage pulling. While they do offer more control than a typical harness, it is not the best idea for a dog that you already have difficulty in handling. This collar was deigned by Ilusion Millan, former wife of Cesar Millan (the "Dog Whisperer"), with the help of designer Jaci Rohr. It acknowledges that there are three parts to a dog's neck. The lower section is the strongest part, and the one in which the dog has the most control, the middle part, and the top part, which is the most sensitive. It takes much less effort to control a dog using the highest part of the neck. Controlling the top part, also allows you to remove the dog's nose from the ground so that your dog is less distracted by sniffing. The Illusion Collar uses the lower part of the neck for support, and at the same time leverages the upper part for control... And communication. You will see many show dog handlers place the leash at this upper, most sensitive part. Unlike a halter, the muzzle prevents a dog from using her mouth. It was specifically created to keep a dog from biting. Either another animal or a person. As such, the muzzle is only a temporary solution. 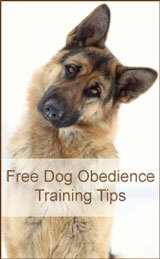 If you feel that German Shepherd needs a muzzle, you should contact an animal training professional immediately. The Prong Collar is also known as a Pinch Collar. It can be an invaluable tool when used correctly. Otherwise, it may cause unnecessary harm. This may not be a good tool to use as a puppy training collar. Generally, it is best for dogs that are well over 30 pounds. The Prong Collar was created to mimic the bite of a mother dog (or other dominant dog) in correcting a wayward pack member. A bite on the neck or scruff is a signal to stop the unwanted behavior. When the collar is tightened, it gives a quick and startling correction like a bite. Used correctly, it should feel like pressure rather than pinching. There are a variety of puppy collars and dog training collars to choose from. No matter which tool you use, it is always best to consult with a professional dog trainer to make sure you are using your chosen method correctly. The last thing you want is to have your method backfire and erode the trust you have with your best friend.